How can cloud consumer attributes be made available to determine cloud resource access control in multiple proprietary clouds? Proprietary cloud providers each have their own methods and protocols for authentication and access control, which contributes to vendor lock-in. A cloud single sign-on (SSO) architecture is established, incorporating an authentication gateway service (AGS) and attribute authority for implementation of cloud resource access control. An AGS and attribute authority connected to a secure token service (STS) are implemented and provisioned with the organization’s cloud consumers’ accounts and attributes. An attributed based access control (ABAC) mode of access control is instituted as the cloud service provider using the organization’s SSO infrastructure. Cloud Consumer A is directed to the AGS for authentication (1). The AGS authenticates Cloud Consumer A and requests an attribute token from Organization A’s attribute service (2). Incorporating an STS function, the attribute service issues an attribute token to the AGS for Cloud Consumer A. The attribute token has a short lifespan, typically around 2 to 3 minutes (3). The AGS provides the attribute token to Cloud Consumer A, which supports access control as an SSO model with attributes of the cloud consumer. The attributes will be used by the cloud service providers to determine access privileges (4). Cloud Consumer A provides the attribute token to Service A to prove authentication and support an access decision for its resources. Cloud Consumer A is also required to use their certificate and a holder-of-key (HOK) assertion as part of the attribute exchange protocol with the cloud service. Without an HOK check, the attribute token can be stolen and used by an attacker (5). 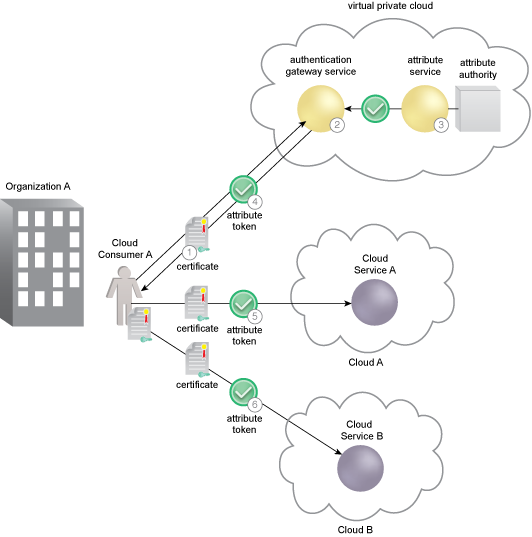 Using an SSO architecture, the cloud consumer provides the attribute token to Service B to prove authentication and support an access decision for its resources. Again, Cloud Consumer A is required to do an HOK check as part of the attribute exchange protocol (6).